A pretty and scarce first edition of the the first published anthology of Hindi Poets. Internally fine and unopened. Describing the visit of Mr.Pim to Peking, where he meets with his colleague Mr Wu, and together they tour the wonderful city that is 1930’s Peking. As a gift to someone who is moving to China or has recently visited this is hard to beat. Things may have changed slightly though. A large format book (38 x 27cm) beautifully illustrated throughout by Friedrich Schiff with a mixture of black and white or colour sketches, photographs taken by Catleen with her Roliflex camera, with colour applied and a full page hand sketched colour map. This copy with the front panel of the original dust jacket loosely enclosed. A superb and fine copy, text in French, illustrated with 33 colour and black & white plates, and 245 half-tone illustrations. 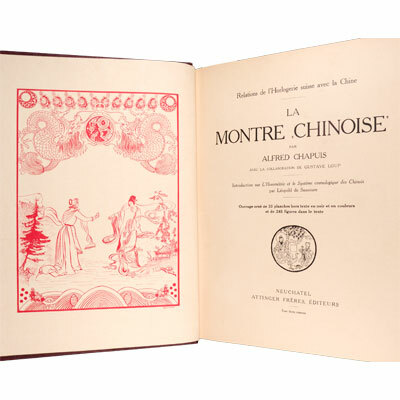 Included is an introduction on ‘L’Horométrie et le Système cosmologique des Chinois’ by Léopold de Saussure. A survey of European cosmological instruments and mechanical amusements introduced to the Chinese Imperial Court from the 14th century, and the elaborate Swiss timepieces made for that market in Europe and in China, the first seeming to be by Francois-Louis Stadlin, a Swiss Jesuit in China from 1707-1740. The whole is referenced with texts from the contemporary writings of ambassadors, merchant traders and churchmen; preceded by de Saussure’s essay on ancient Chinese cosmology. Prominent Swiss makers included Charles de Constant in the 18th century and the Bovet family in the 19th century, and many examples of their timekeepers could be found in the imperial palaces. Formerly owned by Le Comte Alain de Suzannet. An exceptional and mostly unopened example of this celebrated and profusely illustrated account of Robert Sterling Clark’s thirteen month expedition across China’s northern frontier, covering nearly 2,000 miles of largely uncharted territory, primarily on mule and horseback. Beginning in Taiyuan in Shanxi province, Clark and his team, which included the young naturalist Arthur de Carle Sowerby, traversed “Shên-kan” (the provinces of Shaanxi and Gansu), with the intention of creating a detailed topographical map of the expedition route, study the animals native to the region, and collect meteorological and geological data. 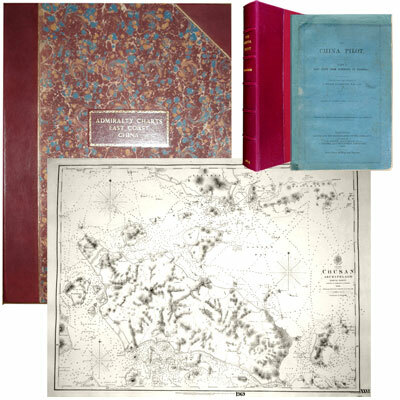 With over sixty-five photographic plates, six tipped-in colour plates, a map of the region outlined in colour, and a large folding map (96 x 51.5 cm) housed in a pocket at the rear. The China Pilot contains sailing directions for the East Coast of China from Hong Kong to Shanghai, including the Meiaco-sima, Loochoo, and the islands to the north-east of them. The work was originally drawn up by Captain Collinson, C.B. from surveys of that coast made by himself, Captain Kellett, C.B. and Lieutenants Bate and Gordon, R.N., between the years 1841-5, and the appendix from surveys of Captain F.W. Beechey, Captain Sir Edward Belcher, C.B., Rear Admiral Cecille, and the officers of the French Corvette La Sabine, and the United States Japanese Expedition, 1851-3. Together with a large finely bound folio atlas containing 25 charts (ten are double page), published between 1840 and 1860. Of which 22 are British Admiralty charts including those of the First Survey of the China Coast by Collinson and Kellett. The remaining three are French Charts. 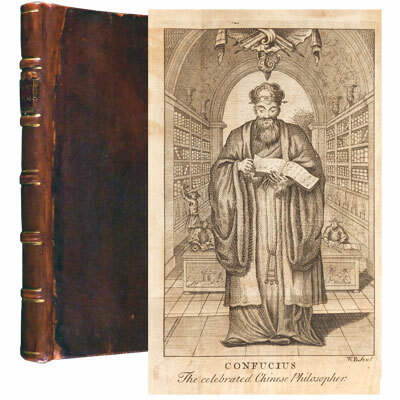 A later 18th century reprint of this work and the first to include the folding frontispiece engraving of Confucius (often missing). First published in 1691 and scarce in any early edition, more so this edition with the engraving. In contemporary binding, and with decorations to title page, six headpieces, and three tailpieces. Beginning with a ‘Preface’ introducing this translation and its sources, followed by ‘Part First’ titled ‘Of the Antiquity and Philosophy of the Chinese’, then ‘Part II’ which offers selected translations from the three books, and ends with 80 ‘Maxims’. ‘The great Chinese teacher Confucius (551 BC–479 BC) articulated a philosophy based on the concepts of ren (‘benevolence’ or ‘compassion’) and li (‘ritual’ or ‘propriety’). He hoped to create the ideal, superior man (junzi) and thereby facilitate a just society. Confucius’s teachings were highly influential across China and large areas of east Asia for almost two millennia before this 1691 work offered English readers their first introduction to his philosophical approach. It provides an account of Confucius’s life and times, as well as 80 of his maxims. This English-language text is based on a French-language edition published in 1688, which in turn relied on a Latin work of 1687 published in Paris.’ - Marsh’s Library, Dublin. 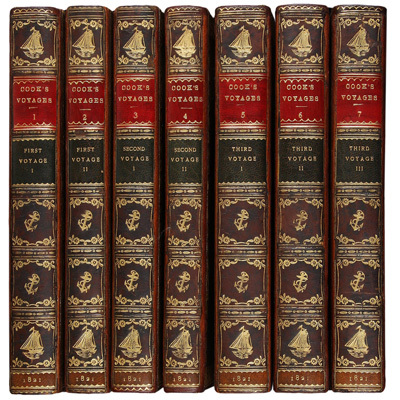 A remarkable seven volume set of all of Cook’s three voyages. Illustrated with twenty five striking aquatint plates, including frontispieces in each volume, large folding map, and a table. 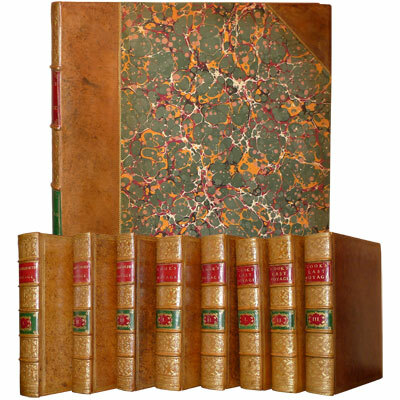 A complete set of the best possible editions, superbly bound in full tree calf and with the additional ‘Death of Captain Cook’ drawn by the John Weber who witnessed the dispute and ensuing fight. Eight quarto volumes and the elephant folio volume of plates. Magnificently illustrated with two hundred and five engraved charts and plates, many of which are double page or larger. There is no greater set of travel works, Cook was the first scientific navigator, these three voyages made great contributions to numerous fields of knowledge,, and did more to clarify the geographical knowledge of the southern hemisphere than his predecessors had done together [Hill]. The first voyage is in its second and best edition, complete with the ‘Directions for placing the cuts’ and the ‘Chart of the Straights of Magellan’, and with the new Preface containing Hawkesworth's virulent eight-page reply to Dalrymple's whining reviews of the first edition, and the whole volume revised by the voyage's astronomer William Wales. The third voyage is in its second and best edition, with the printing by Hughs (rather than Strahan who printed the first edition) with the text itself entirely re-set. Isaac Smith presenting a set on behalf of Cook's widow in 1821 noted that 'I am desired by Mrs Cook to request your acceptance of the 4 books sent herewith being her Husbands last Voyage round the World, as a mark of her respect the letter press of the second edition being much superior to the first both in paper & letter press' (quoted by Forbes, Hawaiian National Bibliography, 85). King George III's copy of the official account, preserved in the British Library, is also an example of this second edition. This particular set with variant title pages, dated correctly, but without edition statement or vignette of Royal Society medal.